Sheet Pan Shrimp Scampi and Roasted Broccoli - the best shrimp scampi and Parmesan broccoli in one pan. So easy, delicious and dinner takes 20 minutes to make! This is my first time making a sheet pan recipe and I made my favorite shrimp dish of all time: shrimp scampi, with a side of roasted broccoli topped with Parmesan cheese. I am loving the idea of sheet pan recipes as it’s so convenient and fast, with amazing results. This recipe is inspired by Delish and Carlsbad Cravings. I love the idea of combining two dishes into one and save time on prepping and cooking. And there is only one pan to clean, less work, more time to enjoy other things. If you want a more substantial dinner, you can just make some spaghetti to go with it. As sheet pan is pretty big, you can double up on the ingredients and cook for a family of 4-6 with no problem. Go and buy a sheet pan and start making this. Trust me, you will love my recipe! Sheet Pan Shrimp Scampi and Roasted Broccoli – the best shrimp scampi and Parmesan broccoli in one pan. So easy, delicious and dinner takes 20 mins. Toss the broccoli with the olive oil, salt and ground black pepper a few times. Transfer them to the sheet pan and spread out in a single layer. Sprinkle the Parmesan cheese on the broccoli. Rinse the shrimp with cold water, pat dry with paper towels. Add the garlic, melted butter, salt, lemon juice, white wine and ground black pepper together. Mix well. Transfer the shrimp to the other side of the sheet pan and spread out in a single layer. Roast the shrimp and the broccoli and shrimp for 12 minutes. Remove from the oven, topped the shrimp with the chopped parsley, garnish with the lemon wedges and serve immediately. All photos and recipes on Rasa Malaysia are copyright protected. Please do not use the photos and recipes without prior written permission. 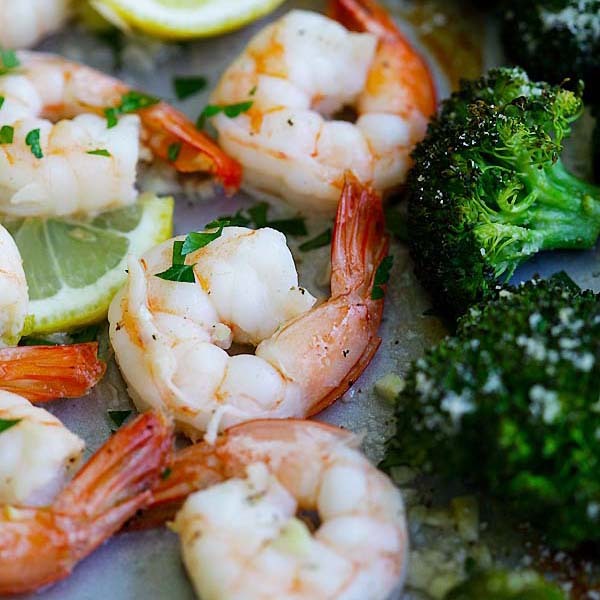 If you wish to republish this recipe, please rewrite the recipe in your own words instead of copy and paste and link back to //rasamalaysia.com/sheet-pan-shrimp-scampi-and-roasted-broccoli/. Thank you very much! Yummy. The shrimps looks so delicious that I can’t wait to have it. Will try this recipe today itself. Thanks for sharing.